Fossil fuels are fuels formed by natural processes such as anaerobic decomposition of buried dead organisms, containing energy originating in ancient photosynthesis. The age of the organisms and their resulting fossil fuels is typically millions of years, and sometimes exceeds 650 million years. Fossil fuels contain high percentages of carbon and include petroleum, coal, and natural gas. Other commonly used derivatives include kerosene and propane. Fossil fuels range from volatile materials with low carbon:hydrogen ratios like methane, to liquids like petroleum, to nonvolatile materials composed of almost pure carbon, like anthracite coal. Methane can be found in hydrocarbon fields either alone, associated with oil, or in the form of methane clathrates. The theory that fossil fuels formed from the fossilized remains of dead plants by exposure to heat and pressure in the Earth's crust over millions of years was first introduced by Georgius Agricola in 1556 and later by Mikhail Lomonosov in the 18th century. The Energy Information Administration estimates that in 2007 the primary sources of energy consisted of petroleum 36.0%, coal 27.4%, natural gas 23.0%, amounting to an 86.4% share for fossil fuels in primary energy consumption in the world. Non-fossil sources in 2006 included nuclear 8.5%, hydroelectric 6.3%, and others (geothermal, solar, tidal, wind, wood, waste) amounting to 0.9%. World energy consumption was growing about 2.3% per year. The use of fossil fuels raises serious environmental concerns. 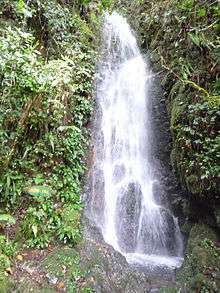 The burning of fossil fuels produces around 21.3 billion tonnes (21.3 gigatonnes) of carbon dioxide (CO2) per year, but it is estimated that natural processes can only absorb about half of that amount, so there is a net increase of 10.65 billion tonnes of atmospheric carbon dioxide per year (one tonne of atmospheric carbon is equivalent to 44/12 or 3.7 tonnes of carbon dioxide). 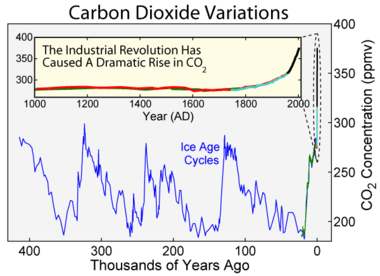 Carbon dioxide is one of the greenhouse gases that enhances radiative forcing and contributes to global warming, causing the average surface temperature of the Earth to rise in response, which the vast majority of climate scientists agree will cause major adverse effects. A global movement towards the generation of renewable energy is therefore under way to help reduce global greenhouse gas emissions. Petroleum and natural gas are formed by the anaerobic decomposition of remains of organisms including phytoplankton and zooplankton that settled to the sea (or lake) bottom in large quantities under anoxic conditions, millions of years ago. Over geological time, this organic matter, mixed with mud, got buried under heavy layers of sediment. The resulting high levels of heat and pressure caused the organic matter to chemically alter, first into a waxy material known as kerogen which is found in oil shales, and then with more heat into liquid and gaseous hydrocarbons in a process known as catagenesis. Despite these heat driven transformations (which may increase the energy density compared to typical organic matter), the embedded energy is still photosynthetic in origin. Fossil fuels are of great importance because they can be burned (oxidized to carbon dioxide and water), producing significant amounts of energy per unit weight. The use of coal as a fuel predates recorded history. Coal was used to run furnaces for the melting of metal ore. Semi-solid hydrocarbons from seeps were also burned in ancient times, but these materials were mostly used for waterproofing and embalming. Commercial exploitation of petroleum, largely as a replacement for oils from animal sources (notably whale oil), for use in oil lamps began in the 19th century. Heavy crude oil, which is much more viscous than conventional crude oil, and tar sands, where bitumen is found mixed with sand and clay, are becoming more important as sources of fossil fuel. Oil shale and similar materials are sedimentary rocks containing kerogen, a complex mixture of high-molecular weight organic compounds, which yield synthetic crude oil when heated (pyrolyzed). These materials have yet to be exploited commercially. These fuels can be employed in internal combustion engines, fossil fuel power stations and other uses. 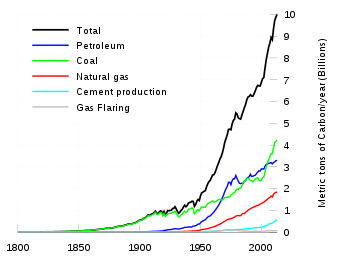 P. E. Hodgson, a Senior Research Fellow Emeritus in Physics at Corpus Christi College, Oxford, expects the world energy use is doubling every fourteen years and the need is increasing faster still and he insisted in 2008 that the world oil production, a main resource of fossil fuel, is expected to peak in ten years and thereafter fall. One of the more promising energy alternatives is the use of inedible feed stocks and biomass for carbon dioxide capture as well as biofuel. While these processes are not without problems, they are currently in practice around the world. Biodiesels are being produced by several companies and source of great research at several universities. Some of the most common and promising processes of conversion of renewable lipids in to usable fuels is through hydrotreating and decarboxylation. The United States holds less than 5% of the world's population, but due to large houses and private cars, uses more than a quarter of the world's supply of fossil fuels. In the United States, more than 90% of greenhouse gas emissions come from the combustion of fossil fuels. Combustion of fossil fuels also produces other air pollutants, such as nitrogen oxides, sulfur dioxide, volatile organic compounds and heavy metals. Harvesting, processing, and distributing fossil fuels can also create environmental concerns. Coal mining methods, particularly mountaintop removal and strip mining, have negative environmental impacts, and offshore oil drilling poses a hazard to aquatic organisms. Oil refineries also have negative environmental impacts, including air and water pollution. Transportation of coal requires the use of diesel-powered locomotives, while crude oil is typically transported by tanker ships, each of which requires the combustion of additional fossil fuels. Europe spent €406 billion on importing fossil fuels in 2011 and €545 billion in 2012. This is around three times more than the cost of the Greek bailout up to 2013. In 2012 wind energy in Europe avoided €9.6 billion of fossil fuel costs. 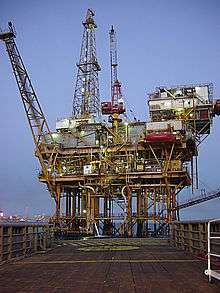 A 2014 report by the International Energy Agency said that the fossil fuels industry collects $550 billion a year in global government subsidies. This amount was $490 billion in 2014, but would have been $610 billion without agreements made in 2009. 1 2 "thermochemistry of fossil fuel formation" (PDF). ↑ Paul Mann, Lisa Gahagan, and Mark B. Gordon, "Tectonic setting of the world's giant oil and gas fields," in Michel T. Halbouty (ed.) Giant Oil and Gas Fields of the Decade, 1990–1999, Tulsa, Okla.: American Association of Petroleum Geologists, p. 50, accessed 22 June 2009. ↑ Novaczek, Irene (September 2000). "Canada's Fossil Fuel Dependency". Elements. Retrieved 2007-01-18. ↑ "Fossil fuel". EPA. Archived from the original on March 12, 2007. Retrieved 2007-01-18. ↑ "What Are Greenhouse Gases?". US Department of Energy. Retrieved 2007-09-09. ↑ "Encyclopædia Britannica, use of oil seeps in ancient times". Retrieved 2007-09-09. ↑ Bilkadi, Zayn (1992). "BULLS FROM THE SEA : Ancient Oil Industries". Aramco World. Archived from the original on 2007-11-13. ↑ Ball, Max W.; Douglas Ball; Daniel S. Turner (1965). This Fascinating Oil Business. Indianapolis: Bobbs-Merrill. ISBN 0-672-50829-X. ↑ Kaldany, Rashad, Director Oil, Gas, Mining and Chemicals Dept, World Bank (December 13, 2006). Global Gas Flaring Reduction: A Time for Action! (PDF). Global Forum on Flaring & Gas Utilization. Paris. Retrieved 2007-09-09. ↑ "US Department of Energy plans for oil shale development". Archived from the original on August 13, 2007. Retrieved 2007-09-09. 1 2 World Proved Reserves of Oil and Natural Gas, Most Recent Estimates. eia.doe.gov. Retrieved on 2012-01-27. ↑ Hodgson, P.E (2008). "Nuclear Power and Energy Crisis". Modern Age. 50 (3): 238. ↑ "The State of Consumption Today". Worldwatch Institute. Retrieved March 30, 2012. ↑ "Electricity Generation". Environment Canada. Retrieved 2007-03-23. ↑ O'Driscoll, Patrick; Vergano, Dan (2007-03-01). "Fossil fuels are to blame, world scientists conclude". USA Today. Retrieved 2010-05-02. ↑ American Coal Ash Association. "CCP Production and Use Survey" (PDF). 1 2 Griffin, Rodman (10 July 1992). "Alternative Energy". 2 (2): 573–596. ↑ Liodakis, E; Dashdorj, Dugersuren; Mitchell, Gary E. (2011). "The nuclear alternative". Energy Production within Ulaanbaatar, Mongolia. AIP Conference Proceedings. 1342 (1): 91. doi:10.1063/1.3583174. ↑ Jerry Hirsch (2 June 2015). "Elon Musk: 'If I cared about subsidies, I would have entered the oil and gas industry'". Los Angeles Times. Retrieved 29 October 2015. 1 2 3 4 Hope, Chris; Gilding, Paul; Alvarez, Jimena (2015). Quantifying the implicit climate subsidy received by leading fossil fuel companies — Working Paper No. 02/2015 (PDF). Cambridge, UK: Cambridge Judge Business School, University of Cambridge. Retrieved 2016-06-27. 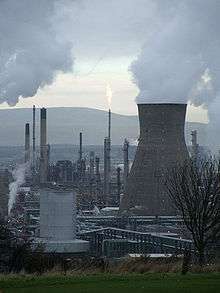 ↑ "Measuring fossil fuel 'hidden' costs". University of Cambridge Judge Business School. 23 July 2015. Retrieved 2016-06-27.